Did you see any of that Channel 4 show, Humans, about a society where robots walk and talk just like us? There are marked similarities as Andy, the synth chauffeur, calmly steers his silent electric vehicle towards Stutton. Somehow, perhaps via an internal sensor, he knows that there's an unvisited eatery around these parts. To a halt, we glide. We've already entered Alton Water and skated past the unremarkable visitor centre towards the boat hire area. I see no caff yet Andy assures me it's right around the corner. Sure enough, he's on the money. 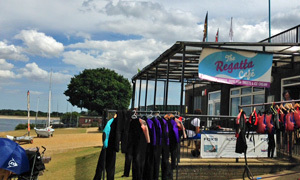 Here's the Regatta Cafe, a seasonal venture apparently open only in July and August. Now that's what I call good timing. Inside they'll do you a bacon sandwich, a (life) jacket, sarnie, etc. Make that an all day breakfast for the driver and, taking advantage of the offer to put almost anything on toast, double egg O.T. for me. Plenty of Famous Five-type kids in wetsuits are seated at tables tucking in to lunch after a tough morning on the beautiful briny. Outside to grab a table on the terrace among trainee teachers talking tacking. That, my friends, is a pleasing view over the water, bringing to mind the likes of Winkles and the View Point, serving to elevate the functional food. Those, though, comments Andy, are some excellent mushrooms. A request for HP is met with an industrial bottle of chef's larder brown sauce, enough for a six-month Caribbean cruise (if Daddy's paying). Weighed down by his egg & bacon, our driver declines dessert but will accept a takeaway beverage, ta very much. In again for an OK pair of lattes, aka milky coffees, and to choose from a wide selection of prepacked cake. Has to be the big choc chip cookie for nourishment through the long office afternoon ahead. If you're heading to the Regatta, bring your yacht. If it was a car -- Fiat Regata. If they were passing by -- Ben Fogle.